Polar bears in the Arctic have become a symbol of the effects of climate change on wildlife but much farther south, penguins are experiencing great changes in their lives as well. 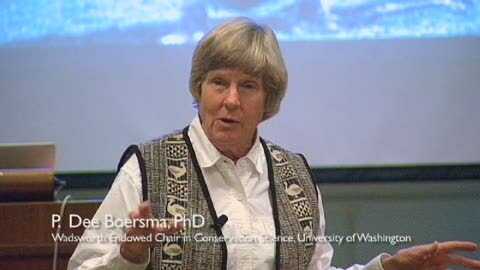 Dr. Dee Boersma, a leading researcher on marine birds, discussed the new challenges confronting temperate penguin species in the 2013 Buchanan Lecture. From the tropics to Antarctica, penguins depend on predictable regions of high ocean productivity where their prey aggregate. Increases in precipitation and reductions in sea ice associated with climate warming are affecting penguins. The largest breeding colony of Patagonian Magellanic penguins, at Punta Tombo, Argentina, had approximately 200,000 breeding pairs in October 2006—a decline of 22 percent since 1987. In the 1980s and 1990s, petroleum pollution was a major source of Patagonian penguin mortality. In 1994, tanker lanes were moved 25 miles farther off the coast of Chubut, and the dumping of ballast water and the oiling of penguins are now rare. However, penguins are swimming 32 miles farther north from their nests during incubation than they did a decade ago, very likely reflecting shifts in prey in response to climate change and reductions in prey abundance caused by commercial fishing. These penguin species, marine sentinels for southern oceans, demonstrate that new challenges are confronting their populations.